My inspiration for this window came from the coin issued for the Queen’s Silver Jubilee in 1977, a possession in which I took real pride. The reverse of this coin shows the Queen riding a horse at the Trooping of the Colour, as I believe the Queen is far more comfortable on a horse than sitting on a throne. I feel this design is calm, respectful and thoughtful, iconic with strength, beauty and simplicity. It allows enough light through, and would stand well alone or in harmony with the other windows. I purposefully held back from over-designing, from filling every space, as I think for this window less is more. I included the flowers of our home nations, and thought it fitting to include a poppy, towards which the Queen is pointing as if she is asking us to remember our servicemen and women after she is gone. 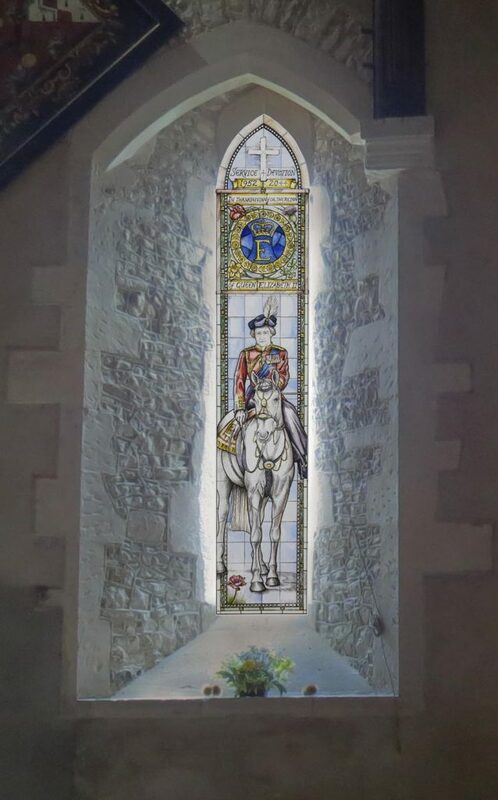 The window should be a celebration for Broad Hinton and Wiltshire, so where better to show the Queen upon a white horse. It also shows a continuity from the white horse in the roundel at the bottom of the Queen Victoria window. Queen Elizabeth has shown her service and devotion to Christ, the British Isles and the commonwealth in a reign that may never be matched. The window would be made by hand by the Canterbury Cathedral Studios.